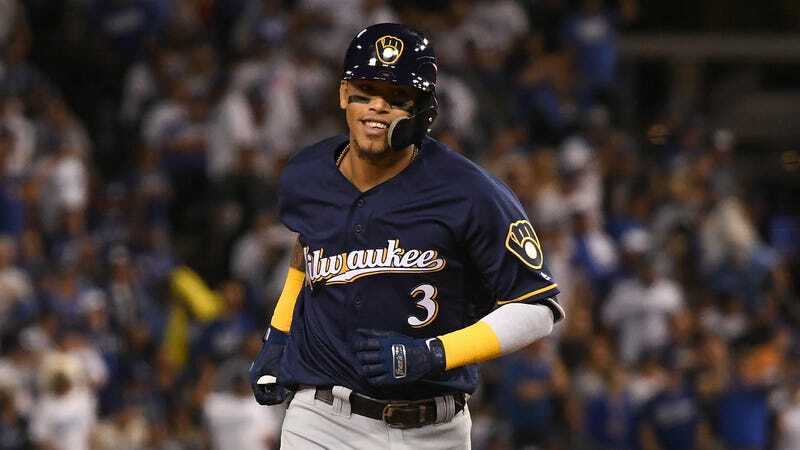 It was amusing when Brewers shortstop Orlando Arcia, one of the very worst regular-season hitters in the league and a guy Milwaukee sent to the minors multiple times in 2018, guided them to a Game 163 victory over the Cubs with four hits. What he’s done since then is downright hysterical. That was Arcia’s third homer of the postseason, which would not be a huge deal except for the fact that he hit all of three home runs in 348 at-bats in the regular season. His postseason slugging percentage is .700; it was .307 in the regular season, and his OPS was .576. That made him one of the most toothless hitters in all of baseball. Now he’s suddenly a reliable source of power in the Brewers’ lineup. After the game, Arcia credited his three homers in 20 postseason at-bats to an improved ability to “recognize pitches,” which, sure, let’s call it that. I don’t even know if you can describe Arcia as being on a “hot streak” since the playoffs started, as his batting average and OBP both sit at .250. This is more a case of a guy who is just running into pitches at opportune times, and that’s often exactly what a small-market team like the Brewers needs in order to make a deep playoff run. It’s also just really fun to watch.